For the best animal hospital, Oklahoma City metro area pet owners trust their pets to the care of the animal clinic conveniently located at Pet-Vet Supply in Midwest City. Choose the animal clinic with nearly 36 years experience at Pet-Vet Supply for all of your pet’s medical care needs. We offer a convenient location, state of the art facilities, and other on-site services to provide you with the best animal clinic in the Oklahoma City metro area. Call us today at (405) 733-4649 to schedule your appointment. It is difficult to find an Oklahoma veterinary clinic that specializes and treats cats. Dr. Fruitt and Dr. Kim are trained in the science of treating specific feline diseases. We offer all necessary vaccinations and preventive treatments for cats to keep them healthy and free of conditions such as feline aids, feline leukemia, diabetes, and hyperthyroidism. Our cat services are some of the best in town and cat owners have been turning to Pet-Vet Supply for the special attention their cats receive here. When looking for an Oklahoma City animal hospital, many do not offer on-site dispensing of pet medications, leaving pet owners searching far and wide to find the medication their pet desperately needs. At the Pet-Vet Animal Clinic, we stock a large variety of the most commonly used pet medications–saving you time, money, and hassle. In addition to prescriptions, we proudly carry a full-line of flea, tick, & heartworm treatments. With our competitive pricing and one-stop shop convenience, pet owners have been choosing Pet-Vet Supply for over 30 years when looking for an Oklahoma City animal hospital. 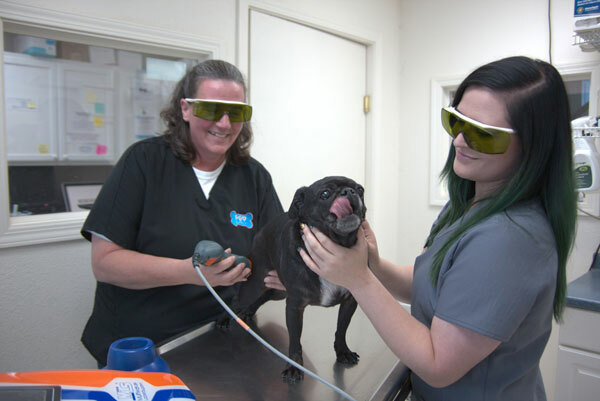 Pet-Vet Animal Clinic now offers laser therapy for your pets. Laser therapy accelerates tissue repair and cell growth, improves vascular activity and provides faster wound healing. Pain associated with many issues such as arthritis, wounds, swelling, and hip dysplasia can be treated with laser therapy. With the most advanced laser therapy system, your pet can be back on their feet in less time.